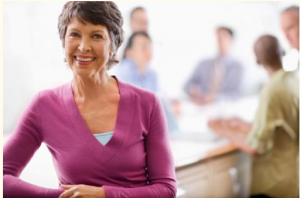 Do you think you may suffer from age discrimination in the job market? Hiring bias against any worker age 40 and older is illegal, but some job seekers still experience it. Be aware of these potential stereotypes so that you can address how you present and describe yourself. Stereotype #1: When you have more experience, employers may assume you’re expensive to hire and retain. Your plan: Research typical current wages to confirm that your salary requirements are appropriate. Be ready to communicate your enthusiasm and willingness to tackle the position offered, rather than a higher level position. Stereotype #2: An employer may believe older workers have low energy and use more sick time. Your plan: Cite your own attendance history if it’s strong. Communicate energy and engagement during your phone and in-person interviews through tone of voice, posture and carriage, handshake, clear focus, and by asking questions. Stereotype #3: Some employers may think older people lack technology skills or will require extra training time. Your plan: In your resume and interviews, note technology training and skills without overestimating them. If this is a weak area for you, explore training options in your community and online to expand your skills and get up to date. Stereotype #4: Some employers think that older workers will leave the job sooner for retirement. Your plan: Find a way to let prospective employers know that you are interested in working for a long time. Stereotype #5: Some employers might think older workers cannot adapt to new workplace cultures or rules. Your plan: Make it clear that you are comfortable with change and can follow protocol. Many older workers perceive that they are passed up for jobs, promotions, or pay raises because of their age. Age discrimination is prohibited by the Age Discrimination in Employment Act of 1967 (ADEA). If you believe you are the victim of age discrimination, you can contact the Equal Employment Opportunity Commission for assistance. Thank you for recommending this great resource for career counselors and others who work with older job seekers.